Turn Me Up in My Wedge, Please! Add stage monitors to your PA rig without breaking the bank with Peavey's affordable PV 12M floor monitor. Handling 500 watts program and a whopping 1000 watts peak, these wedges have the oomph to easily slice through your stage volume. The classic trapezoidal shape sits sturdily at a 30- or 45-degree angle from the floor, depending on which side you rest it on -- so you can angle your PV 12Ms exactly as the drummer, keyboardist or singer needs them. And as an added bonus, the PV 12M monitors have a built-in bracket for pole-mounting. That means that you can add two speaker stands and a power amp, and instantly turn two floor monitors into a main PA system. Peavey is known for the tough, road-worthy products in their long-running PV series, and the 12M floor monitors are no exception. 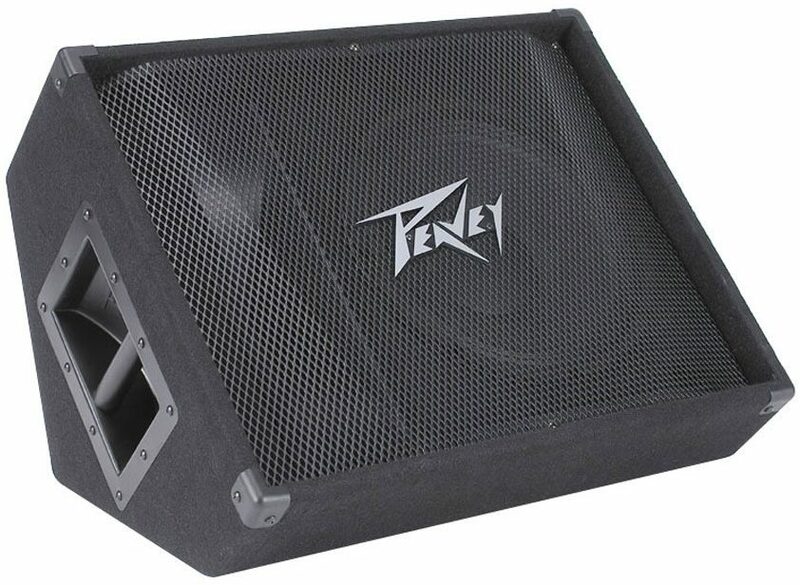 Peavey PV 12M floor monitors employ a simple, low-profile design. Behind the heavy-duty steel grille, you'll find Peavey's two-way speaker system: a 12-inch Sheffield Pro woofer and a 14XT titanium-diaphragm driver with a 90-degree by 40-degree constant-directivity horn. The carpet-covered box has a sturdy steel handle for easy transport, and on the other end, you'll find the 1 3/8" pole-mounting bracket and dual parallel 1/4" input jacks. Two input jacks mean you can plug in your 1/4" speaker cable to one monitor, and plug in a second 1/4" speaker cable to a second monitor. After all, at this price, you'll want to pick up at least two PV 12Ms. Remember, when you set up two 8-ohm loudspeakers in parallel, you're effectively reducing the speakers' resistance to 4 ohms. The PV 12Ms have a nominal impedance (or resistance) of 8 ohms, so simply divide 8 by the number of PV 12Ms you're running in parallel. Reducing resistance by daisy-chaining your monitors increases power to the monitors: picture the signal coming out of your power amp and into your monitors as traffic traveling down a highway that's now twice as wide. Increasing power can result in speaker overload. That's why Peavey's exclusive Sound Guard IV provides overload and overdrive protection for your horn driver. So go ahead -- daisy-chain a second PV 12M to cover a wider area with the same monitor mix. Sound Guard means fewer blown drivers for monitors that last. With 500 watts program power (also known as continuous power, or RMS) and 1000 watts peak -- and a maximum SPL of a healthy 127 dB -- these Peavey PV 12M speakers are powerful enough to be more than just floor monitors. In fact, a pair of 12Ms make a fantastic main PA for those impromptu house party gigs. If your band needs a pair of monitors for your practice space, but you also want a portable PA so you can host a battle-of-the-bands at your drummer's barbecue, the Peavey PV 12M is a perfect choice. These speakers have a standard 1 3/8" pole-mount cup for mounting on speaker trees. Add a pair of tripod speaker stands to elevate your PV 12Ms above the crowd for the whole backyard to hear. The Peavey PV 12M floor monitors are compact and lightweight because they're passive speakers. That means they don't require power cables, but they do require a speaker-level input from your power amp or powered mixer. When matching speakers to power amps, the rule of thumb is to use an amp that can deliver twice the wattage of the speaker's continuous (program) power rating. Peavey makes it easy for you: the PV 12Ms are rated at 500 watts continuous power at 8 ohms, so to get the most out of your monitors, match them to an amp that can deliver 1000 watts per channel into an 8-ohm load. If you've already got a power amp or powered mixer, PV 12M floor monitors are a perfect choice to complete your system. Quality floor monitor wedges aren't a luxury -- they're a must-have for delivering a solid stage performance. Luckily, the PV 12M floor monitors have the power you need to cut through the stage and hear the whole band. Add monitor wedges to your practice space or live PA rig with the Peavey PV 12M floor monitors. Make your vocals really cut through! Rated at 500 watts program and 1,000 watts peak power handling capability, the rugged, trapezoidal Peavey PV 12M is built to withstand the rigors of the road. The PV 12M can be angled at either 30 or 45 degrees from the floor in addition to being pole mounted. This two-way system features a 12 in. Sheffield Pro 1200+ premium woofer and a 14XT 1.4-inch titanium-diaphragm compression driver (no piezos) coupled to a constant-directivity horn with the exclusive Sound Guard IV high-frequency driver protection. Two 1/4", full-range parallel inputs allow easy daisy chaining. Top quality performance from a very affordable, low-profile stage monitor! Sound: It sounds ok, but a little on the brassy side. Feature: good shape--wedge and can use as a PA speaker on a stand Ease of Use: sounds ok, but a little bright Quality: seems ok. Value: It is a good value, but I replaced the 14 XT compression drivers with RX22's--blew the 14 XT's just like another person said. The RX22's made the difference Manufacturer Support: no problems The Wow Factor: It's ok, cheap Overall: Having replaced the copmpression drivers with RX 22's it should last forever now. Overall: I actually use two of these daisy chained together for my band. We send a vocal heavy mix out to these and it reproduces the sound very nice and clean. I also like that they aren't too heavy and are well constructed with good handles and a metal grate covering over the speaker.